Gamma Technologies develops GT-SUITE, the leading CAE system simulation software. It provides a comprehensive set of component libraries that can be used to build accurate models of almost any engineering system. These components include vehicles, engines, drivelines, transmissions, general powertrains and mechanical systems, hydraulics, lubrication and friction, thermal management, cooling, chemistry, aftertreatment, and more. It offers engineers functionalities ranging from fast concept design to detailed system or sub-system/component analyses, design optimization, and root cause investigation. With such a large and complex product, Gamma Technologies wanted to give users flexibility on how they chose to interact with and use the product. For customers who wanted to be able to run the GT-SUITE from the command line, they needed a script that called the executable file. Originally they had implemented PerlScript for this task but it proved insufficient. ActivePerl is the industry-standard, commercial-grade Perl distribution used by thousands of enterprises. Easy installation and quality-assured code make it the Perl distribution of choice for developers around the world. Whether for mission-critical applications, open source projects, or simple scripting tasks, ActivePerl offers significant time savings and simplicity over open source Perl for installing, removing, upgrading, and managing common Perl modules. ActivePerl offers a number of advantages over PerlScript including the superior security and features that it provides. Additionally, ActivePerl is commercially backed and users have peace of mind knowing that it complies with corporate policy requirements for open source products, includes a full license review for all precompiled third-party Perl modules with assurances to minimize risk, and protects organizations from legal risk with indemnification coverage. Gamma Technologies has successfully used ActivePerl as a part of the GT-SUITE software solution for over ten years. It has quietly worked in the background, providing flexibility and ease to users and enabling Gamma Technologies to focus on their core software solution. ActivePerl has been part of the GT-SUITE for almost a decade, without any support issues arising. Gamma Technologies prides themselves on providing superior quality software that is flexible, comprehensive, and easy to use. 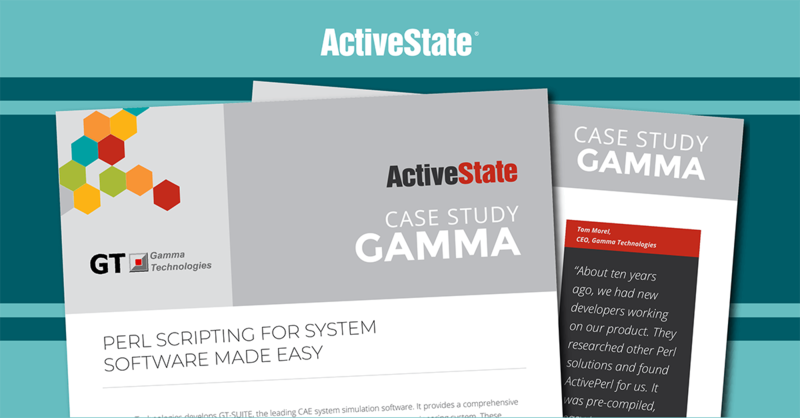 ActivePerl helps enable Gamma to deliver the flexibility they need in GT-SUITE.